The verdicts slammed into Christopher DiMeo like the four shots he fired into Tim Donnelly. Guilty of murder. Guilty of murder. Guilty of capital felony. And guilty of first-degree robbery. DiMeo winced with the first verdict Wednesday in Bridgeport Superior Court, then pursed his lips at each successive finding and glanced briefly at the ceiling. 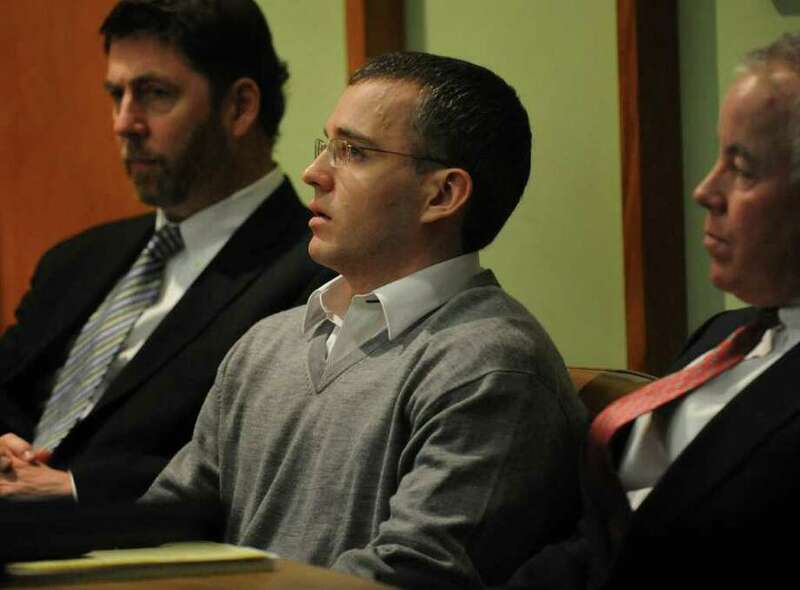 The jury of six men and six women deliberated less than four hours before finding DiMeo guilty of the Feb. 2, 2005, deaths of Fairfield jewelers Tim and Kim Donnelly. They will return to court on Feb. 28 to decide whether he should get the death penalty. As they filed into the courtroom to deliver their verdict, one female juror was visibly upset, dabbing her eyes with a tissue. For his part, DiMeo showed no emotion until after the verdict was announced. Then he sat down at the defense table and sighed. Later, he shook hands with his lawyers before being taken away by judicial marshals and corrections officers. "Now we are going on to the penalty phase," said DiMeo's lawyer, Assistant Public Defender Michael Courtney, as he left the Main Street courthouse. "We are going to put on a lot about his family life and I think we will do OK."
Senior Assistant State's Attorneys Joseph Corradino and Margaret Kelley, who prosecuted the case, declined comment as they left the courtroom, as did members of the Donnelly family who have sat vigil in the courtroom since the trial began Jan. 18. The state's case against the 29-year-old DiMeo appeared overwhelming. DiMeo, who had previously robbed three New York jewelry stores killing the manager of one, next targeted the Donnellys' small Post Road store. The day before the crime his girlfriend, Nicole Pearce, had scouted out the store and drawn the sketch of the interior. Shortly after 5 p.m. Feb. 2, DiMeo walked into the store carrying a shopping bag. After engaging the couple in a conversation over engagement rings he pulled out a semi-automatic pistol and, as Kim Donnelly screamed, fired four shots into her husband. He then shot her five times. As the couple lay in pools of their own blood he calmly began filling the shopping bag with jewelry. Liam Burke, the Donnelly's landlord who had come downstairs from his office above the store after hearing screams, saw DiMeo in the store filling the bag. When he confronted him DiMeo told Burke he was the couple's uncle. Dale Nel heard Kim Donnelly screaming, "No! No! No!" facing a man with her hands up. And then a series of gunshots. Tim Donnelly's blood was found on DiMeo's boots, in his car and on his gun, the same one he used to kill the New York jeweler. DiMeo confessed to the crime when he was arrested in Atlantic City two days after the murders. Pearce, though suffering from terminal cancer, testified from her hospital room that DiMeo did the crime. And then the coup de grâce, from Dimeo's own lawyers, who told the jury DiMeo killed the Donnellys. Yes, but, Courtney argued to the jury, DiMeo did it but he's no serial killer or criminal mastermind "He's just a junkie with a gun." He contended that DiMeo, a heroin addict, had no intent to kill the Donnellys when he entered their store but did so either because he was high or because Tim Donnelly made a grab for Dimeo's gun. But Corradino countered in his summation that four gunshots into Tim Donnelly and five into his wife were evidence of DiMeo's intent to kill. He also argued that DiMeo's murder of the New York jeweler in December 2004 showed he had a propensity to kill. The only note the jurors sent out Wednesday before arriving at their verdict was one asking if they could consider the New York murder in deciding whether DiMeo intended to kill the Donnellys. Judge Robert Devlin told them they could.